MiCOM Alstom P543-P546 is a range of transmission-class protection relays providing high-speed current differential unit protection. They are designed for all overhead line and cable applications, interfacing readily with the longitudinal (end-end) communications channel between line terminals. The interface options support direct fibre optic, or multiplexed digital links. The P543 to P546 offer resident subcycle distance protection, to complement the powerful suite of main and backup protection. Full scheme, five-zone distance protection is adopted from the class-leading MiCOMho Alstom P443. The P543 to P546 becomes the standard in all HV, EHV and UHV line protection applications, duplicated where dual redundant main protection is demanded. 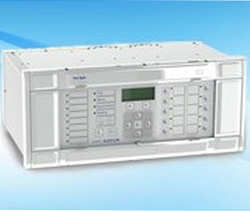 Set any combination of differential, distance, overcurrent and reclosing, depending on the site needs. One universal relay type instead of two or more discrete models means reduced spares holding, less training, and lower cost. The MiCOM Alstom P544 & P546 are suitable for the complex installation and feeders controlled by two circuit breakers such as breaker-and-a-half configurations. A universal relay that reduces spare holding - apply as a current differential relay, a distance relay, or both!